Christmas is a time for giving and spending time with family. Sadly more than 24,000 people in Britain will spend Christmas sleeping rough, on public transport, or in tents. Homelessness doesn’t discriminate; it can affect anyone of us. Crisis is a national charity for homeless people. Crisis works directly with thousands of homeless people every year. They provide vital help so that people can rebuild their lives and are supported out of homelessness for good. They offer one to one support, advice and courses for homeless people in 12 areas across England, Scotland and Wales. How they may help someone may depend on their individual needs and situation. It could be help with finding a home and settling in, getting new skills and finding a job, or help with their health and wellbeing. Together with homeless people and Crisis supporters, they campaign for the changes needed to end homelessness for good. I became involved with Crisis as a volunteer two years ago in a bid to support their Crisis for Christmas volunteer effort that helps homeless people during the Christmas period. There are lots of volunteering roles to fill, such as helping to cook and serve meals, volunteering as a hairdresser, health professional, befriender or entertainer. During my dental career, I have worked across a variety of settings including dental practices, community or hospital. As a dental nurse, a large part of my role is oral health education and raising awareness of the importance of good oral health. I have always wanted to see how I could support our more vulnerable members of the community. So, I found out about volunteering as dental nurse with Crisis for Christmas through a fellow dental colleague. 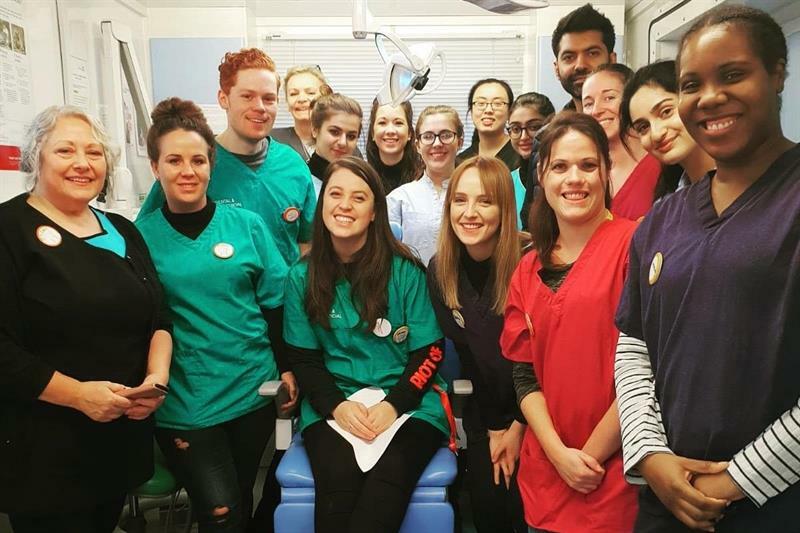 During my role as a volunteer, I rotated and helped with various roles, which included booking guests in to see the dentists, giving oral health advice to guests, assisting chairside as a dental nurse and assisting with decontamination and sterilising instruments. The dental service provides a range of routine dental treatments for our guests – and hygienists to provide a range of routine dental treatments – check-ups, scale and polish, fillings and extractions under local anaesthetic – in addition to basic dental health advice and education. This year, we have dental technician who will be able to make dentures to give some of our guests their smile back. However, as well as volunteering my services as a dental nurse, with my boyfriend who is also volunteering his services running the IT hub, we both raised money for Crisis to help them to deliver services and support.